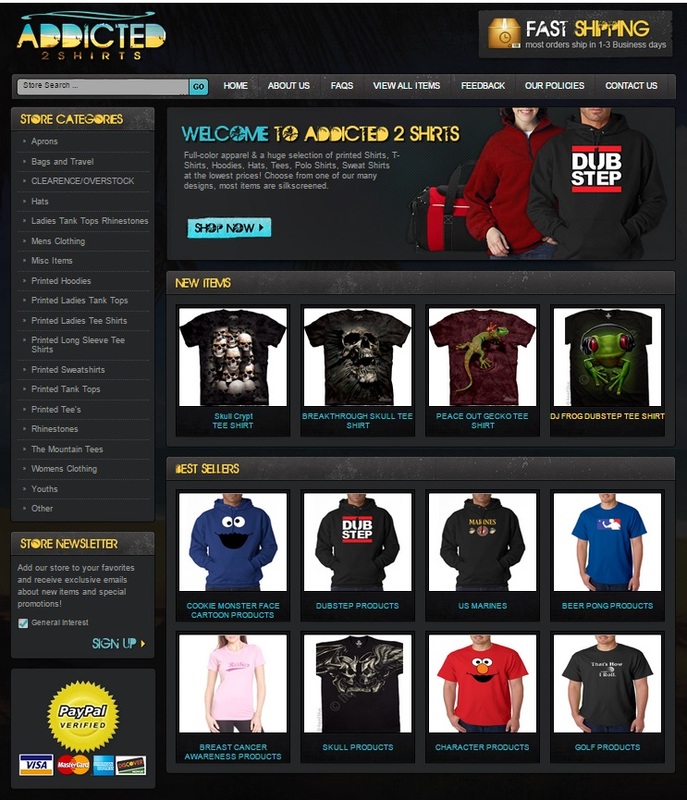 We’re pleased with the custom ecommerce package we put together for our client, Addicted 2 Shirts. We wanted a great way to help this company boost their profits and gain brand awareness. By taking advantage of our ecommerce package option, and saving $400, they were able to have two new platforms from which they could sell their goods. We created both an eBay storefront and a custom ecommerce page for our client. The result was two great-looking sites and an increase in customer sales. At OCDesignsonline, we take special care of all of our clients’ needs. We want every person we serve to be satisfied with the job we complete. For some of our clients, we work hard to ensure that their ecommerce and eBay stores coordinate with one another. For others, we ensure that the stores are best suited to each target audience. When it came time to design the sites for our client, Addicted 2 Shirts, we took care to have sites that complemented one another. When it came to the eBay storefront, we focused upon drawing customers into the store. Thus, we created a header showcasing some of the types of items customers could find in the store. We also created a “new items” section where customers can, at a glance, see some of the offered products above the store’s fold. Store categories and custom category buttons based upon store best sellers also help customers to navigate this store easily. While we included some unique selling points on the store’s landing page, we also created a menu where customers could learn more about our client’s policies. With the ecommerce site, rather than offer a new items column or best sellers column for products, we simply divided products out by type and created custom category buttons based upon the type of product for which customers might be searching. We also included content describing the store’s products and history so that customers landing on the homepage could easily learn more about the company from which they would be making their purchases. This, in combination with the sidebar listing categories of products helps customers to not only navigate the site once they are on the site but also to find the site in the first place. Here at OCDesignsonline, we have a wide array of eBay listing templates from which you may choose. Take a moment to browse our portfolio and when ready, request a free quote. Also, don’t forget to find us on Facebook, follow us on Twitter and check out our Google+ Page too!